Ultimate why? – Physics says what? Perhaps the ultimate why question: Why is there something rather than nothing? Sean Carroll’s blog is a feed on my blog. I enjoyed reading his recent post and paper on this question. Quite a challenge to summarize the topic in 15 pages. I’ve talked before about the issue of why the universe exists at all (1, 2), but now I’ve had the opportunity to do a relatively careful job with it, courtesy of Eleanor Knox and Alastair Wilson. They are editing an upcoming volume, the Routledge Companion to the Philosophy of Physics, and asked me to contribute a chapter on this topic. Chapter 25 “Why Does the Universe Exist?” of Carroll’s book has more on the topic, in particular addressing the “conviction that the existence of the universe demands some kind of explanation.” He notes that “just because these questions are common, it doesn’t mean they’re the right ones to ask.” And brute fact. There may be answers to these questions, either in naturalism or in theism. Or we may have to live with simply accepting the universe the way it is. What we can’t do is demand explanations that the universe may not be able give us. Krauss wrote an entire book which tackles the question. I like the overview of possible answers on pages 4 – 5 of his paper: creation, metaverse, principle, coherence, brute fact. Also, a reminder on page 10 about Leibniz’s Principle of Sufficient Reason: “Once we think of the laws of nature as describing patterns rather than causal forces, and the notion of cause and effect as being appropriate to higher-level emergent descriptions of the world rather than the fundamental level, the PSR loses its luster.” Or, as Neil deGrasse Tyson put it, “The universe is under no obligation to make sense to you.” Or whether nothing is more natural than something (p. 13). Or nothingness is a coherent idea (p. 14). One purported answer — “because Nothing is unstable” — was never even supposed to explain why the universe exists; it was suggested by Frank Wilczek as a way of explaining why there is more matter than antimatter. Personally, I’d like to see a broader interdisciplinary framework for the question. More inclusive than a general religion and science divide, theism and naturalism. Interdisciplinary sciences of all kinds. Certainly at Caltech that’s one dramatic change in the last 50 years — all kinds of interdisciplinary centers and titles. Carroll shares that pragmatic tone in his post (“as a contribution to a volume on the philosophy of physics, not the philosophy of religion”). So, although in Chapter 25 of his book, Carroll refers to the maxim “ex nihilo, nihil fit,” he does not get into the theological history of ex nihilo. [Wiki] In theology, the common phrase creatio ex nihilo (“creation out of nothing”), contrasts with creatio ex materia (creation out of some pre-existent, eternal matter) and with creatio ex deo (creation out of the being of God). Creatio continua is the ongoing divine creation. Krauss also asks, “What is the difference between arguing in favor of an eternally existing creator versus an eternally existing universe without one?” Carroll has no “gigantic turtle” story in his paper. Krauss likewise has a brute fact conclusion: “The universe is the way it is, whether we like it or not.” And he spends some time clarifying the notion of nothing like Carroll does (especially in Chapter 9). In the context of moving from “causes” to laws of physics, Krauss also has a useful story about dispensing with the need for angels to guide the planets. In general, his book allows time to cover more traditional theological and religious topics, such as nonbeing, Intelligent Design, and God of the Gaps, as well as introduce Occam’s razor and a limit of plausibility (cf. Carroll’s discussion of credence). … at least some properties of our particular universe are ultimately contingent. … We are always welcome to look for deeper meanings and explanations. What we can’t do is demand of the universe that there be something we humans would recognize as a satisfactory reason for its existence. Both Carroll and Krauss also discuss the myth of Sisyphus (cf. my poem). These arguments always remind me of the famous story of an expert giving a lecture on the origins of the universe (sometimes identified as Bertrand Russell and sometimes William James), who is challenged by a woman who believes that the world is held up by a gigantic turtle, who is then held up by another turtle, and then another . . . with further turtles “all the way down!” An infinite regress of some creative force that begets itself, even some imagined force that is greater than turtles, doesn’t get us any closer to what it is that gives rise to the universe. Cf. Space.com: “Our Universe Isn’t As Special As We’d Like to Believe” (February 13, 2018). The early Greeks knew the Earth was round, but most of them could not imagine that the land they walked on was anything but the dead center of reality. It took more than 350 years for the Catholic Church to apologize (in 1992!) for imprisoning the great heliocentrist astronomer Galileo Galilei and forcing him to recant his description of the solar system. In the modern era, no serious thinker argues that the Earth has some special physical centrality in the universe. … All the evidence of the great telescopes has shown that Earth is just another small, rocky world orbiting a smallish sun in a far-flung region of a medium-size galaxy. I first explored this question in grad school. After studying theology, I started a program in philosophy and psychology. Weird (if not senseless) questions like “Why is there something rather than nothing at all?” But also the problem of universals and cognitive theory. Regarding philosophy of science, I assume that we’ve moved beyond logical positivism (see Wiki’s Critics and Retrospect sections on the term). Perhaps the context of universal statements includes universal questions, eh, regarding verification, validity or truth. So some other comments (to Carroll’s post/paper) address whether the question is meaningless. (As distinct from not meaningful?) Krauss sets the question in a class of questions which are really “how” questions. One might also just take a pragmatic position — what questions or type of questions might produce useful results (be that technological, social, etc.). Or the context of expectations for the question — that something new might be learned or observed. Is there “something” only because there’s an observer? (If a tree falls in the forest … I think therefore I am — there is something.) Quantum physics is increasingly based on the reality of things that cannot be observed. Yet, we increasingly can observe things at the atomic level. And theory increasingly guides experimental observation and detection — confirmation of predictions. In some ways, I see the scientific method (and frameworks of credence) as ways to increasingly move away from arbitrariness in habits and ways of thinking, especially those which place us — individuals, groups, nations, planet — at the center of the universe. That is, help us get beyond tribal beliefs (while celebrating cultural diversity). The question “Why is there something rather than nothing?” has value in addressing that context — a mashup of what people consider facts and their behaviors and beliefs, including sources of authority and tolerance of uncertainty. Interdisciplinary insights might help, as in biology, sociology, neuroscience (cf. Brain Games) and language development; and the context of shared values and species survival. Regarding observing what was once considered impossible, there’s been a lot of science news this week about a prize winning photo of a single atom, as noted here for example. Just some clarification on what we see in this photo. Atoms can be excited by another source of light, electricity or collisions with other atoms. 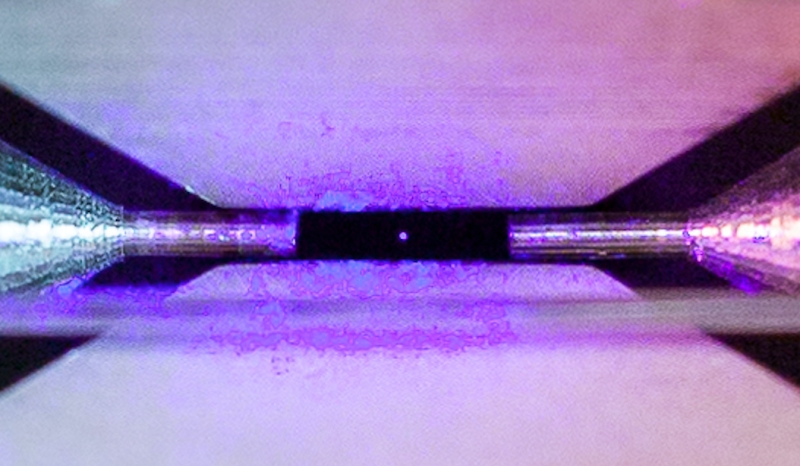 … So our single atom emits light that we can try to image with lens to see where it is located. … Atoms are very small, hundreds of times smaller than the wavelengths of the visible light. Optical systems are limited by diffraction and other aberrations, so the light from a point is not collected into a single point in the image, but spreads in some shape, that shape is known as PSF (Point Spread Function). For a point in the center of the image, PSF should be circular, but still larger than a point. The size of the point in the image does not correspond to the size of the atom, but depends on the properties of the lens. Interestingly enough, if we have a single atom, we can determine its position much more precisely that the size of PSF. If our sensor’s pixels are small enough, we can calculate the position of PSF’s center to subpixel precision. However, from the image alone, we aren’t able to determine if we see one, two or hundred atoms close together. Their PSFs will overlap too much to separate.